Sold by Rambo Deals (4.8 out of 5 | 17 ratings)and Fulfilled by Amazon. Gift-wrap available. Sold by Rambo Deals and ships from Amazon Fulfillment. Ships from and sold by I K ENTERPRISES. If gazing at the moon, planets or viewing beautiful landscapes is your hobby, then the new Celestron powerseeker 60AZ is the telescope you should be looking for. 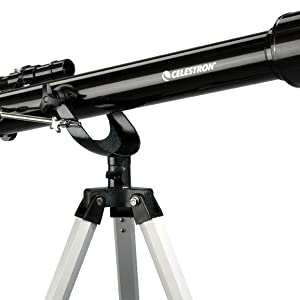 The Celestron powerseeker is a dual purpose telescope that helps you view astronomical and terrestrial objects. 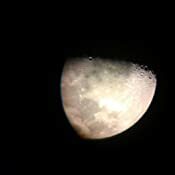 Be it the distant celestial bodies or tracking moving objects in the sky or on land, all of these can be seen clearly with the help of the slow motion control feature. 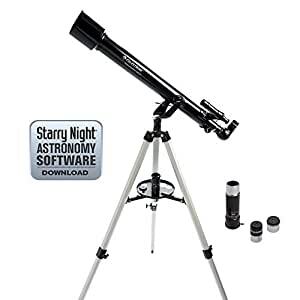 Plus, this telescope is easy to set up and use as it requires no tools. 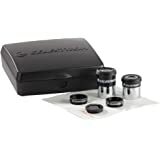 The Celestron powerseeker 60AZ telescope comes with two eyepieces - 20 mm which offers 35x magnification and 4 mm which offers 175x magnification. It also has a 3x Barlow lens to enhance the magnifying power of the eyepiece and make it almost triple the size. 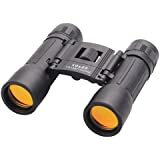 The Celestron powerseeker telescope has optic coating with high transmission feature to increase brightness of the images and also optimize passage of light. 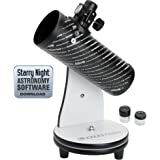 This telescope features fully coated glass optical parts for ultimate clarity. Altazimuth mount makes it extremely stable and secure, eliminating wobble while viewing. 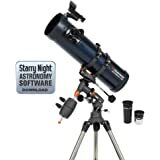 This telescope is a must-have for an aspiring astronomer. 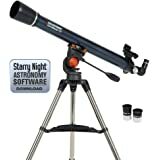 Tracking the night sky with this amazing Celestron powerseeker telescope is very simple thanks to its smooth motion controls. It comes with a software package "The SkyX", which includes data about planets, their moons and also has sky maps that can be printed. 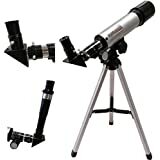 So as a beginner, if you are looking for a power-packed telescope with a rich bundle of features, quality and is yet easy on your pocket, check out the Celestron telescopes online. The PowerSeeker 60 is a refractor telescope perfect for terrestrial and celestial viewing on the go. The PowerSeeker can view the planets, moon, star clusters and brighter deep sky objects like the Orion Nebula and Andromeda Galaxy at night. 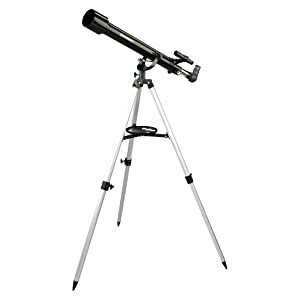 The erect image star diagonal makes the optical tube ideal for using as a spotting scope during the day. The PowerSeeker 60 comes with two eyepieces (20mm and 4mm), erect image diagonal, finderscope, and a Barlow lens. The two eyepieces offer different magnifications to view your intended object. The 3x Barlow lens triples the magnifying power of each eyepiece. 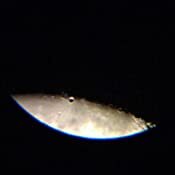 The erect image diagonal allows for right-side-up viewing ideal for terrestrial subjects but can also be used for celestial objects. The finderscope will help you quickly center an object in your eyepiece for easier observing. 2.0 out of 5 starsNot for the impatient ones ! 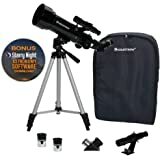 Let me give you the perfect review .,first of all i wasn't very convinced about buying this product at first due to all the bad reviews but then i read some guides on astronomy from small telescope etc.., which showed a number of objects to see from small scope and to me that was very convincing and i bought this. First of all the finder is really cheap and bad quality which makes star hopping impossible secondly clusters and other DSOs are very faint in it ..The tripod is steady enough but the real shakiness comes due the long tube like structure of the scope which makes it shake very much on slightest touch which in turn makes focusing and star hopping a near impossible task..Trust me if you have fairly clear skies and don't care about seeing the rings on Saturn or any other planetary details then 10x50 binoculars are way better start as they are 1000 times easier to handle and carry and u can still see tons of clusters and a few DSOs with it which is sure a way better start..
1.This can be a perfect buy for someone just interested in seeing the craters on the moon or rings on saturn or jupiter with its four moons. 2. 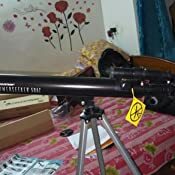 If someone is already interested in astronomy and is sure of pursuing the hobby. Could see all the bacteria and aliens on the moon craters. All the stars in the Andromeda clearly discernible. But most importantly, you can also see the black hole at the centre of the Milky Way. Class, today we learnt irony. 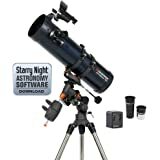 This is a very good telescope for beginners and amateur astrophotographers. 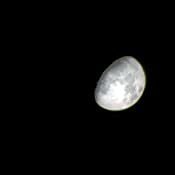 You can see a very good close-up of moon. Other plants appear as faint objects and you cannot see them very clearly. Assembling is quite easy. You have to track objects manually which can take some time and practice to master. 3.0 out of 5 starsBut over all fine. tripod could have stronger. Cannot lie done and focus. But over all fine. It is hard to get this to focus on anything. The image is too shaky & the Barlow lens are useless. It killed whatever interest I had in astronomy. 5.0 out of 5 starsExcellent for beginners..
My brother gifted it to my daughter. She's very happy..and keeps herself occupied with it all the time..else she kept troubling me for letting her watch t.v. We can take a close view of the nearby mountains..and stars and moon.